Wasabi, a plant that grows in Japan near mountain springs or streams, is a member of the Brassicaceae family which also includes horseradish, mustard, and cabbage. It is an important condiment in Edomae-zushi because it helps to bring out the flavors of the sushi-dane. It also exhibits antimicrobial properties and sterilizing capabilities and helps to stimulate the appetite. Fresh wasabi provides a wonderful, spicy aroma and taste and also brings a delicate sweetness to sushi. A good itamae will grate only as much wasabi as is needed; the wasabi's flavor and aroma fade quickly after being grated. A metal or shark skin oroshigane is used to grate the root-like stalk. The itamae places a small dab of grated wasabi between the tane (topping) and shari (rice) before serving the piece to the customer. Wasabi's flavor profile works well with most tane so it is used for most types of nigiri. 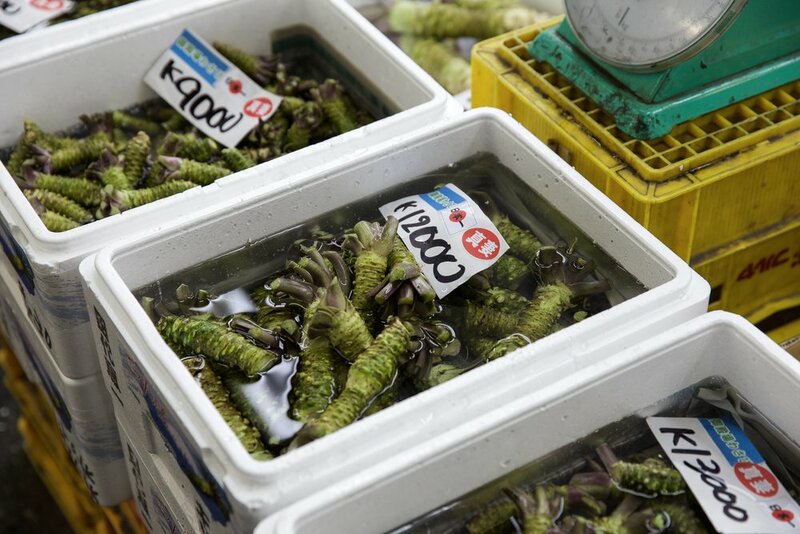 The photos above, taken at Tsukiji market, feature wasabi from "Tsukiji Spirits" - a respected wholesaler of high-grade wasabi and other condiments.